Matt Pagnozzi (L) and Irving Falu pose for the camera on Photo Day in 2013. 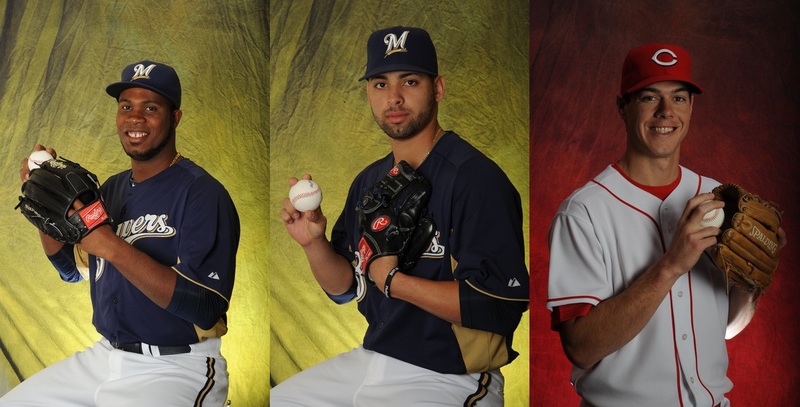 On Wednesday it was announced that the Milwaukee Brewers had signed a pair of free agents to minor league contracts. Those contracts include invitations to big league camp at Maryvale come February, officially labeling both new additions as “non-roster invitees” or NRIs. The two players involved are catcher Matt Pagnozzi, late of the Houston Astros system, and utility infielder Irving Falu, most recently of the Kansas City Royals organization. Full write ups of their pasts will come during the 2014 edition of “Brewers By the (Jersey) Numbers”, but for now let’s go ahead and give you a little taste. Matthew Thomas Pagnozzi (hey kids, he’s on Twitter! 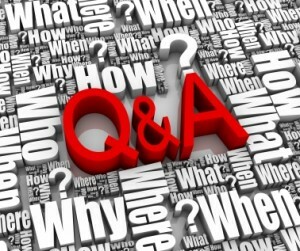 @MattPagnozzi) is a 31-year-old veteran of 11 seasons in professional baseball. He’s been employed by six different organizations including five in the last three years. Pagnozzi doesn’t hit much but has a solid reputation as a defensive-minded catcher. The Brewers could use a quality receiver to work with the next wave of prospects at Triple-A Nashville. Barring injury, that’s Pagnozzi’s likely destination when camp breaks at the end of March. Irving Falu (Twitter: @irvingfalu) is a native of Puerto Rico who was first drafted in 2001 by the San Diego Padres and then again in 2003 by the Royals. He is 30 years old and as the polar opposite of Pagnozzi has only known one organization. In a beautiful irony that Brewers fans can appreciate, Falu made his MLB debut in 2012 after injury sidelined Yuniesky Betancourt. Perhaps Falu can permanently replace Betancourt in the Brewers organization going forward. Forever. And ever. Both of these players will be heavily involved in Spring Training. Pagnozzi as a top MiLB catcher and Falu as a switch-hitting infielder who can back up at second base, third base and shortstop. The business of baseball has no off-season. This was evidenced once again today when the Los Angeles Dodgers made a trade with, of all teams, the Boston Red Sox. Yes, the same Boston Red Sox who are about to take the field for Game 1 of the 2013 World Series. The Brewers are keeping busy as well, outrighting three players off of the 40-man roster today. As with any outright assignment, the players were first designated for assignment, thereby being exposed to waivers. 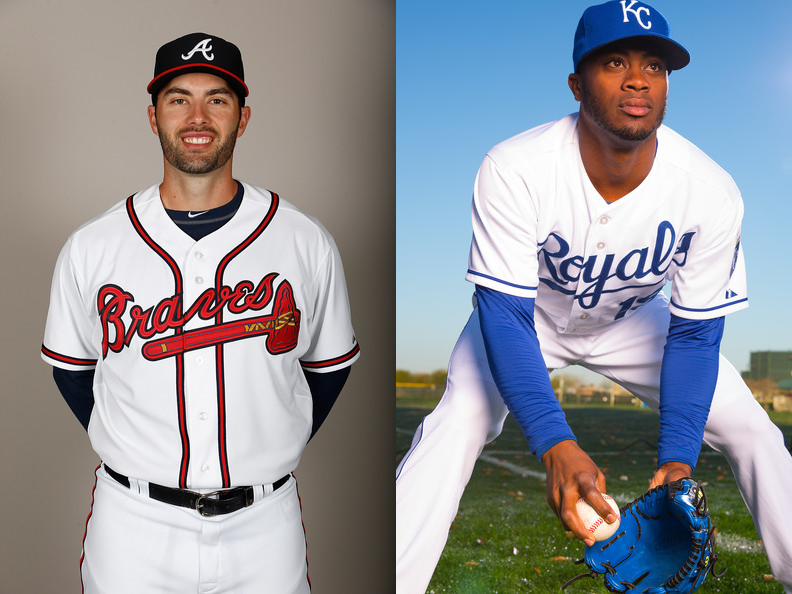 All three cleared waivers and were assigned outright to the Triple-A Nashville Sounds. It was the first DFA for Manzanillo and Ravin so there was no stickiness with regards to rights of refusal for them, but Jesus Sanchez has been outrighted once before (Phillies, 2010) so he could still declare himself a minor-league free agent. The three players removed are all right-handed pitchers. Santo Manzanillo was added to the 40-man roster before the 2012 season but missed almost the entire year due to injuries suffered in a car crash in his native Dominican Republic. Jesus Sanchez, a converted catcher, was added to the 40-man before this past season. He pitched well at Nashville in 2013, though not as well as in 2012. Still, he has shown promise. The third player, Josh Ravin, was just acquired by the Brewers off waivers from the Cincinnati Reds organization earlier this month. Ravin was first added to the 40-man roster of the Reds following the 2012 season as well. It’s basically a paperwork only move as all three pitchers, assuming health, will likely be pitching at Maryvale in Spring Training with the Brewers. 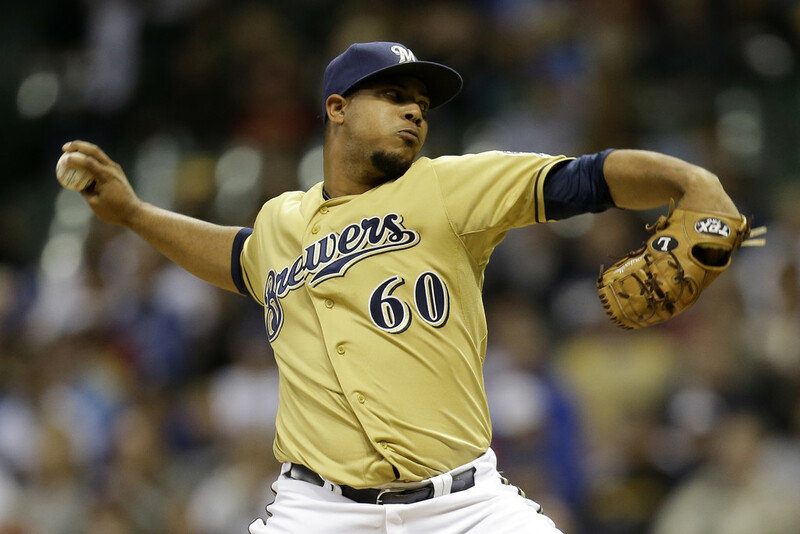 The biggest immediate impact these moves have is clearing space on the Brewers 40-man roster. The roster stands at 35 today with two spots spoken for already and the other three probably already earmarked as well. Ryan Braun and Rickie Weeks will take two spots when they are respectively reinstated. Miguel De Los Santos might take one if he ever comes off of the restricted list. And, among many others to be considered, the Brewers’ last two Minor League Players of the Year — Hunter Morris and Jason Rogers — both require protection from the Rule V Draft for the first time this off-season. The Brewers should get two more openings when free agents declare, by way of Michael Gonzalez and Yuniesky Betancourt, but Corey Hart may take a spot if he is resigned. In other words, there is still much flux to be unfluxed before the season begins. Following Wednesday night’s 5-4 loss to the Chicago Cubs, the Milwaukee Brewers made another roster move. After a night which saw Yuniesky Betancourt have to play left field, the Brewers purchased the contract of 1B/OF Sean Halton from the Triple-A Nashville Sounds. He fills the available spot on the 40-man roster which opened up when LHP Chris Narveson was designated for assignment a few days ago. 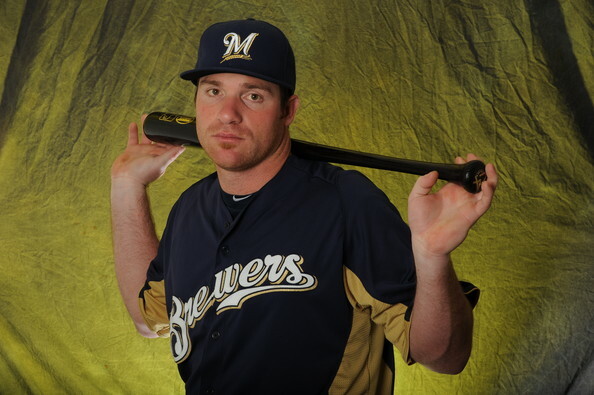 After being drafted (for the third time) in the 13th round of the 2009 First-Year Player Draft out of Lewis-Clark State College in Lewiston, Idaho, Halton has followed a fairly steady climb through the Brewers’ system. 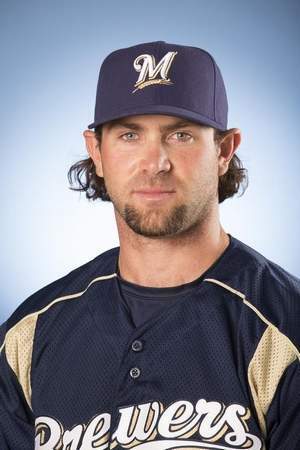 He played in rookie ball in 2009, split 2010 between Low-A Wisconsin and High-A Brevard County, spent 2011 with the Double-A Huntsville Stars, and debuted with Nashville to begin the 2012 season. He’s been repeating the PCL circuit in 2013 until he got the call. Halton, 26, is a first baseman by trade but was converted into an outfielder this season with the arrival of 1B Hunter Morris to Nashville. It was a move not only to accommodate the more highly-touted Morris, but also to give some versatility to Halton in an effort to increase his worth to the parent club. Much the same way that learning the outfield helped Josh Prince make his MLB debut this year, the work has paid off for Halton as well. It wasn’t just the defensive flexibility though for the 6’4″, 255 lb Halton that earned him his call up. In the month of June, Halton has slashed .378/.435/.622 in 82 at-bats, with 15 runs scored, 15 RBI, and 11 extra-base hits (6 2B, 1 3B, 4 HR). Those numbers have raised his season slash line to .288/.338/.492. Halton will be making his Major League debut (wearing this jersey number), but whether Halton will see much time at first base as a platoon partner for Juan Francisco remains to be seen. One thing we do know is who will be feeding Halton the ball on throws from the second base position. That’s because in order to make room for Halton on the 25-man roster, second baseman Scooter Gennett was optioned to Nashville. Gennett will benefit playing every day with the Sounds as the Brewers continue his development, but he also didn’t exactly set the world on fire in his audition. Gennett hit just .214 in 42 at-bats. He’ll be back, but regular playing time makes sense for him at this time. But through all of this, Yuni B remains. Zombies, cockroaches, Yuni.